Johnny Redbeard decided to turn his powers inward, mutating himself into a monstrous humanoid that he renames himself as the Creator. He began to truly thrive when Chicago was destroyed during the Martian invasion. A large majority of the survivors within the devastated city sought out powers to better survive in such a landscape. 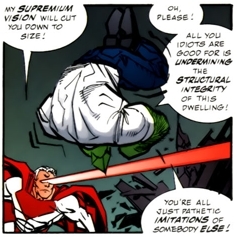 One of the Creator’s creations was Supremium, a powerhouse who was one of a group based on existing superhumans. The Dragon stumbled across this group of freaks while being given a tour of the under-construction Chicago, following the fall of CyberFace. In the resulting fight, Supremium and his companions were all killed while protecting the Creator from his own falling headquarters.